This time has been reserved for a private party! Want to get together with friends, family or co-workers and be creative? 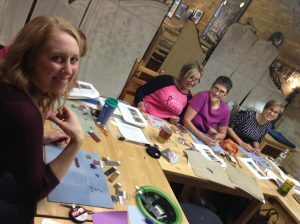 Learn to create your own jewelry with a basic necklace, bracelet or earring project at Funky Hannah’s! These projects are perfect for all skill levels. Come to Funky’s and let our fabulous artist instructors inspire you and show you how easy it can be to make your own jewelry! We’ll give you loads of design ideas and share with you all our tricks for making knock out jewelry! Cost is $20 per person and includes supplies. Check out our full class schedule & join in the fun! Classes are small, usually 4-8 students, are held one morning, afternoon or evening, include great handouts and are taught by some of the best instructors in the area! If you have a small group of people but can’t make the date we have the class scheduled, call or email us! The project may be available as a private class for your group depending on teacher availability and your group needs. Consult with our design staff to create your own bridal party jewelry! Bring inspirational photographs, color swatches, &/or sentimental jewelry that needs a re-do and we can help design the perfect one of a kind accessories for your special day! We can custom create for you or you can invite your friends here and have a party as you make it yourselves! Cost will vary based on materials used. A $20 per person class fee applies & covers use of space, tools and instructor. Two person minimum. Our classroom space is well lit & comfortable with seating for up to 12. A kitchenette area with refrigerator, hot plate & microwave are available for your use. Groups are welcome to bring in snacks, hors d’oeuvres, & beverages (wine is fine!). There are many fine eateries & Uncorkt wine shop in our lovely downtown, available for carryout or delivery to our party room!